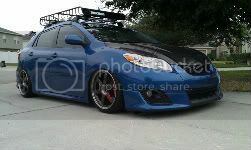 Toyota Nation Forum : Toyota Car and Truck Forums > Toyota Passenger and Sports Car Forums > Corolla and Matrix Forum > Corolla 10th Gen/2nd Gen Matrix (2009-2013) > Corolla wont turn on??? Any ideas? Corolla wont turn on??? Any ideas? My first guess is electrical. Do you have HIDs installed? I'd start checking fuses, sounds like one is blown if your remote isn't working. Check your battery, check fuses. Do you have a OBD-II reader? Does the car start if you pump the gas pedal repeatedly? If so, check the fuel pressure. I had the same problem with my 1.8L Matrix. It turned out the fuel pump and regulator were bad. I had a no-start issue with my corolla. Got up one morning hit the key and it just cranked and cranked. Checked the battery ... seemed fine... took battery to Sears and tested fine. Put battery back in car. Checked all electrical connections and fuses... no problems. No start. No way to tell if this is it, but I'm only passing on what I've been told. The dealer said something similar and that they have only had this happen once with each car with no repeats. Hope they are right! That's strange as I've had mine sit for over a week with no problems. Good tip if it should happen to others though. Why do you say the battery seems fine? Have you gotten it tested? Sounds like your battery was dead and you killed it even more. Buy a different econobox like an Elantra, or upgrade to a better built vehicle like an Acura TSX or BMW 3-series or MB 2xx. Come on TACOKID. You go through all of the hoops just to get post on this forum, yet its all for nothing. You come back with more useless posts. If you came here and actually contributed or tried to help that would be different. But if beating the crap out of dead horses were a profession you would likely have monopolized the industry by now. Do you REALLY think a car not starting (from a dead battery most likely) is a reason to change your entire car. One that you claim to own as well. I really think you should seek professional help. You have a serious underlying problem with being obsessive it seems. Ill leave this open for your reply. Last edited by hardtopte72; 12-19-2012 at 07:39 AM. I had the same problem on repeat gas pedal i could start my 2011 corolla. Now it is running fine. DO i need to take it to toyota service on a safer side? Also, will there be any warranty on fuel pump related faults?